B.E.S. 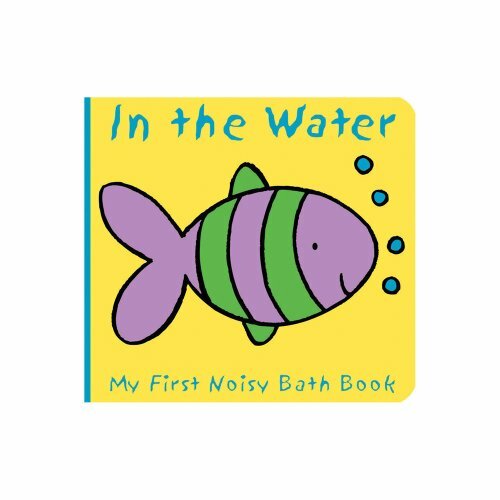 Publishing - Drop this amusing waterproof book in the water with baby's bath for a festival of noisy, humorous animal pictures appear on every floatable vinyl page, splashing fun! Bright, and a rattle embedded inside the book makes an amusing jingle that will evoke baby's laughter. Baby can see pictures of a crab, a school of fish, an octopus, a starfish, and a seahorse. B.E.S. Publishing - Drop this amusing waterproof book in the water with baby's bath for a festival of noisy, humorous animal pictures appear on every floatable vinyl page, splashing fun! Bright, and a rattle embedded inside the book makes an amusing jingle that will evoke baby's laughter. The friendly animals that romp through these pages are a sheep, a pig, a hen, a horse, a dog, and a cow. B.E.S. Publishing - The rattle embedded inside of the book jingles delightfully, ensuring baby's laughter every time. Make a splash with this waterproof book that is perfect for a festival of bath-time fun! Baby will enjoy splashing and playing with this bright, gorilla, including an elephant, giraffe, flamingo, humorous book filled with adorable pictures of amazing zoo animals, and more. B.E.S. Publishing - The rattle embedded inside each book jingles delightfully, ensuring baby's laughter every time. Make a splash with these waterproof books that are perfect for a festival of bath-time fun! Baby will enjoy splashing and playing with these bright, including a whale, rainbow fish, sea lion, humorous books filled with adorable pictures of incredible sea creatures, giant turtle, and others. B.E.S. Publishing - Suddenly, the animals change as if by magic as they take on their normal colors. The animals pictured on every page are pure white--until kids dip them in the bathwater. A farmyard pig turns from white to pink when he gets wet in this book of farmyard scenes. This truly unusual vinyl picture book for toddlers will add to kids' bathtime fun. There are also a hen, a goat, a cow, and other animals that change color in the bath. Workman Publishing Company - Now i kiss you on the nose. Spattered with colors from a long day at the easel, washcloth in hoof, the pig takes to the tub, determined to get all pink and clean. Gently scrub from top to toes. Get it? squeaky clean? Bath time! is waterproof, nontoxic, completely baby-safe—and it floats! It’s a classic tale of pig meets paint. All clean! squeak squeak! On the last page, the snout has a bound-in squeaker. From the irrepressible Sandra Boynton comes an irresistible storybook for bath time. Hey! hey! what do you say! It’s time to take a bath today. B.E.S. Publishing - Each foam-padded page is constructed of sturdy, floatable vinyl, and shows a picture of a friendly animal. A smiling octopus who turns blue and a curious looking sea horse who turns green are just two of the many sea creatures who change color in this book. Toddlers will have fun with this book at bath time. When kids dunk these books into the bath water they get a big surprise. When the pages dry out, the animals return to their original white. The book is packaged in a transparent plastic bag with a hanger card. B.E.S. Publishing - The animals pictured on every page are pure white--until kids dip them in the bathwater. This truly unusual vinyl picture book for toddlers will add to kids' bathtime fun. Suddenly, the animals change as if by magic as they take on their normal colors. This book of cheerful woodland scenes features a frog who turns from white to green when he gets wet. There are also a rabbit, a bumblebee, and other animals that change color in the bath. Workman Publishing Company - Because let's face it, board books are highly impractical in the tub. Here comes barnyard bath! it’s a waterproof cousin of Barnyard Dance!—the famous board book bestseller. Safety-tested, nontoxic, and so much fun—just like Bath Time!, Boynton's first bath book. Used book in Good Condition. And what could make tub time more fun than a book? Especially one that floats. North-South Books - Make a splash with this appealing bath book edition--which features the same foil-stamped scales that fascinated young children in the original picture book. Sure to be a favorite tub toy, bed time, beach time, this soft but sturdy little book with its message about sharing is perfect for the very youngest child--at bath time, anytime! Used book in Good Condition. Modern Publishing - A soft, playtime, stain resistant book for infants and toddlers that is perfect for bath time, or anytime! Used book in Good Condition. Used book in Good Condition.